You may not realize it, but the key to selling your merchandise and building your brand lies in the hang tag you choose. Like an employee name tag, only prettier, it is the first thing shoppers look at and is your brands ambassador; Which is why every detail, from the color and shape to the information and images you put on it, have to be planned with as much thought as you give to your collection. Think about it- when you see a shirt or jacket you like, what’s the first thing you do? You look at the tag to see what it’s all about. So, what your hang tag says, or doesn’t say, matters. And with a hang tag, you have the unique opportunity to “speak” directly with consumers and engage them. Plus, in a sea of never ending white tees or dark denim, that tag can really make you product stand out, leading to increased sales and exposure. There are a lot of great ways to use a hang tag to your advantage and build your brands reputation, and we here at Sun Tat Labels can help you with it all. From marketing strategies to design tips, will run down what you need to do and help you bring it all to life. Have a special logo and want shoppers to instantly recognize it? Place it on the front of your hang tag; that way, when they are scanning racks of clothes, they’ll be able to spot yours immediately. This strategy works well, as shoppers will often overlook other articles of clothing when they see a familiar hang tag. Also, try to put important company information, like your company’s web address, so they can see everything you have to offer and share your info with family and friends. Visualizing what a shirt or a pair of capris will look like off a hanger and on an actual person, without having to try it on, can sway a shopper; so, putting an image of a model wearing the product is another great way to go. That one image can sell your product for you more than a thousand words. Plus, you can have the model wear a complimentary piece in the picture and include information on it, giving you a 2-in-1 advertising boost. No matter what you put on your hang tag, the products information should be included. Shoppers don’t like looking inside hangers for sizing or the materials you use, so put it where they can easily see it. Plus, you can also share anything that makes your product stand out, like the fact you donate part of your proceeds to cancer research or use dye free fabrics. 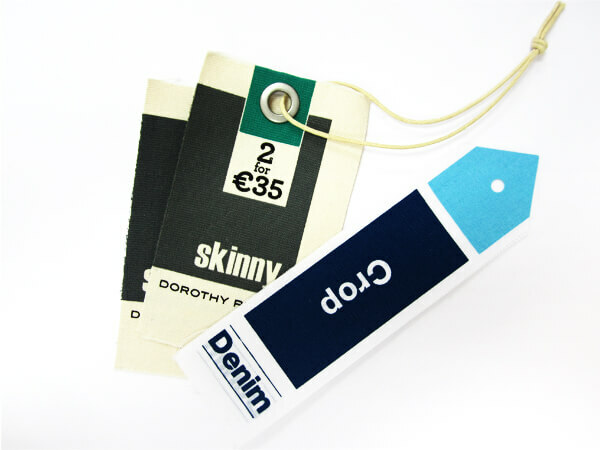 A smart way to use a hang tag to your advantage is by putting pricing or discount information on it; you can print it directly on the tag, or add a price sticker. Just make sure the numbers are easy to see. If you really want to get creative, you can turn the hang tag into a coupon, giving shoppers money off their next purchase if they show the hang tag. 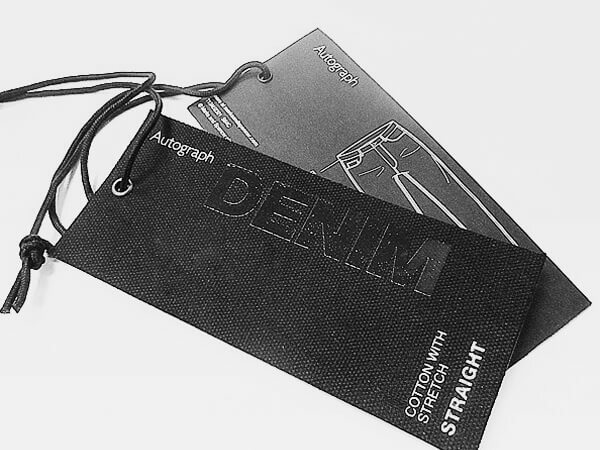 A hang tag is a reflection of your product, so use quality materials that give the appearance of being expensive and lasting. In addition to signaling to shoppers that you care and want only the best for them, using durable materials ensures the information on it won’t get lost. For instance, a flimsy tag may rip, eliminating product sizing or your company’s motto. There are leather, embroidered, and silk screen options, giving you versatility and flexibility in choosing a style. You want your tag to stand out without taking over; it should complement and enhance the piece it is attached to, so test different fonts and colors. For instance, if you are selling a neon green surf shirt, bright red lettering will clash and be a bit off-putting. On the other hand, if you sell neutrals, a tag with glittery or metallic lettering will pop. Same goes for the font. If you choose something too busy or with a lot of swirls, it may look pretty, but it could be too hard to read. Look for fonts and colors that fit into your line without being over the top or look like you’re trying too hard. In a world of squares and rectangles, be a diamond. What we mean is, choosing a shape other than the traditional ones can really work to your advantage, especially if it fits your company theme. For example, if you sell ski jackets, a hang tag in the shape of a ski lift is clever and will show shoppers you have a playful side. Just make sure the shape works for the information you want to put on it. If it is too small or big for the picture or product info, you may need to go a different route. As you can see, hang tags can make or break your brand. If you’re considering creating a one-of-a-kind hang tag, Sun Tat can help you. From choosing a design and figuring out what materials will work best, we’ll walk you through the process from start to finish and produce the hang tag of your dreams. 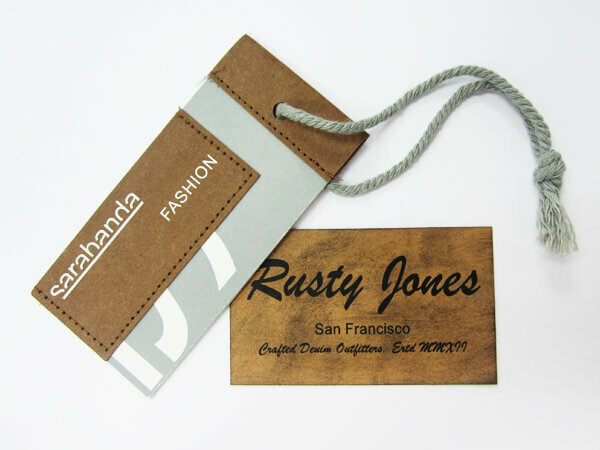 Embossed leather, heat transfer labels, retail packaging and more, you’ll find everything your brand needs right here! So, if you want to elevate your brand and increase sales, contact Sun Tat today.